Let’s face it… no one likes to think about bad things happening to them, much less planning for them – Disaster Recovery Planning is one of those “important, not urgent” action items that (unfortunately) gets pushed to the back burner. 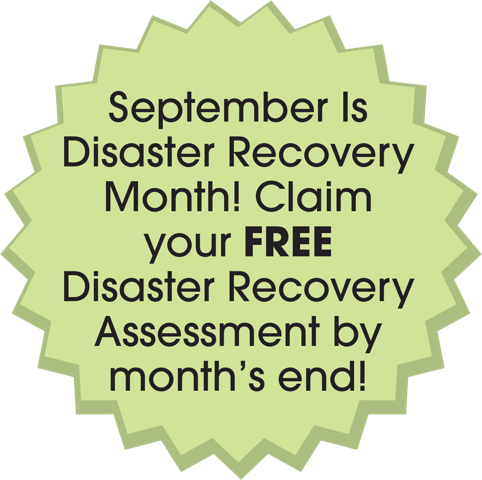 But since September is National Disaster Preparedness Month, we wanted to get you jump-started by giving you a Disaster Recovery Business Assessment (a $297 Value) – for FREE! How fast you could realistically be back up and running in the event of any natural or human disaster. Since this is free, you have no good excuse not to do it now. If we don’t find any problems, you’ll at least have peace of mind that your network is secure and that you could recover quickly in the event of a disaster. But if we DO find a few loopholes, you’ll be able to fix them BEFORE you experience an unexpected catastrophe. Offer is Only Valid During September 2015!